Local Government Management Board and NCVO (1993) Building local partnerships. Local Government Board. Arnstein, S. (July 1969) A ladder of Citizen participation in the USA. Journal of the American Institute of Planners. Taylor, M. (1992) Signposts to community development. Community Development Foundation. London. Burton, P. (1993) Community profiling. School for Advance Urban Studies, University of bristol. Forbes, D. Hayes, R. Reason, J. (1994) Voluntary but not Amateur. London Voluntary Service Council. 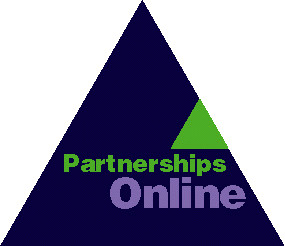 There are further resources about partnerships and participation at http://www.partnerships.org.uk/part/links.htm and also in The Guide to Effective Particiaption (see above). Jo Hutchinson and Mike Campbell of the Policy Research Institute, Leeds Metropolitan University have produced Working in Partnership: Lessons from the Literature as Research Report 63 for the Department for Education and Employment. (June 1998). ISBN 0 85522 788 5. This sifts the main lessons and provides a comprehensive review of resources. Unfortunately not online.